In this time of austerity, new stealth taxes and record cuts Hammersmith and Fulham Conservatives have excelled in one area: Our tiny Borough now has some of the highest paid bureaucrats in the United Kingdom. 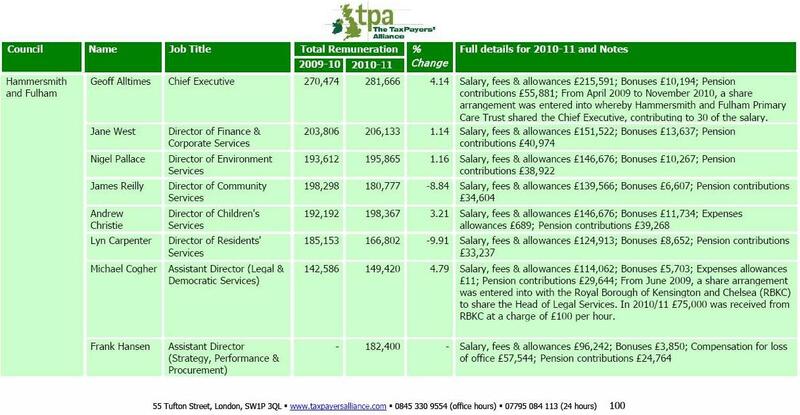 The TaxPayers’ Alliance has published the remuneration for the financial year 2010/11 and demonstrates that local residents paid out £1,561,430.00 to just a handful of (often unnecessary) senior officials but this figure doesn’t include “consultants” that were actually employees; or agency workers that were actually employees; or senior employees in its 100% owned housing management company. Add those figures in and you get double that figure and a sum equivalent to each Borough resident getting a 5.4% council tax cut. Consider that in the last few months the BBC uncovered how H&F Council have wasted £12m on consultant/employees, are operating outside UK tax laws and botched back office mergers; that the former CEO received a £270,000 tax free lump sum pay-off, gets a £104,000.00 annual pension and if that wasn’t enough had £7,000.00 of tax payers' money lavished on him at an afternoon booze-up. Meanwhile, this is all happening when new food banks are opening up in the Borough and others struggle to pay H&F Conservatives' stealth taxes. It's understandable why many residents now say this Conservative Administration is completely out of touch. At the last election my Labour colleagues and I campaigned to cut the size of the senior management team and stop outrageous pay hikes. We will do that again in 2014 and will spend the proceeds on cutting all council taxes and giving the residents of this Borough high quality local services.